Both my flat winners this week stopped riding in the closing stages after breaking clear, luckily they had enough to press on when challenged, hope the race kit get some serious attention in so7 as it will not be long before this costs someone a race, sometimes it feels like it is just using gallop logic. It has cost trainers in the league in past seasons. It will happen again. Definitely needs to be addressed in SO7. I think it was Scatters who said there is a hidden stat and I believe he may be correct. I have horses in my game that have very good potential and speed bars but can't win a Group race. I have others who's bars are not as good who will win 10+ G1s. I didn't trial at all for this season - I can't see the point - although I understand for the trainers that smash out a truck load of horses that they need to do it. Anyway I am expecting Jim and John's low rated horses to come good in Group Company. The problem is that 2 or 3 horses in every race will run a shocker, it's the crappy CK. It's a reason why our trial races can be all over the shop. My horse in the same race ran a shocker and is rated 70, i'll run him in a better race non h'cap because I don't feel comfortable running in a h'cap. There is no way he's a 70 rated horse. On behalf of all the handicap trainers - thanks for not running him/her in a handicap next start. Know it has happened before doug, I have profited and suffered from it. Just adding fuel to the fire that we need to burn the racekit on. And I have always believed bars are only half the battle ever since my second league season and getting winners whilst looking at the images posted from Paul and the like knowing how far away my horses were on that basis, you and I spoke a little on it during that interview a few seasons back. I have significantly advanced my thinking on this in prep for this league having pushed for bars and trailed throughout that journey, after adding big chunks from my original stock. Don’t get me wrong, get both together and your laughing and there is only so far the things we cannot see will take a bad horse, but they are not the be all and end all. I have even started to look at combinations, so for example full extra is nice but does that mean a horse just burns out faster and fades if constitution of low, something that is a main stat and ignored as much as battling qualities. Can bars actually make a horse worse without the other components? Run style etc, and I think there are clues in game horses too. Not quite gotten my head around this and it is only a theory but there are defiantly combinations I look for in the NH now and these seem to be born out in trial. It goes to show its very different over jumps because a lot of my horses have full bars apart from my 2 mile chasers that don't have that great a bars and yet they are probably my strongest part of my team. Only full bars I have in my NH team, least from the big three is potential. new and very old throws up something special. Have u bred him to a flat horse!!! None of my chasers have anywhere near full cruise+ speed bar. My best hurdler that is 2yo Brideled Turn has awful looking bars, the worst of any jumper I've ever had in the league but has finished 1st and 2nd. 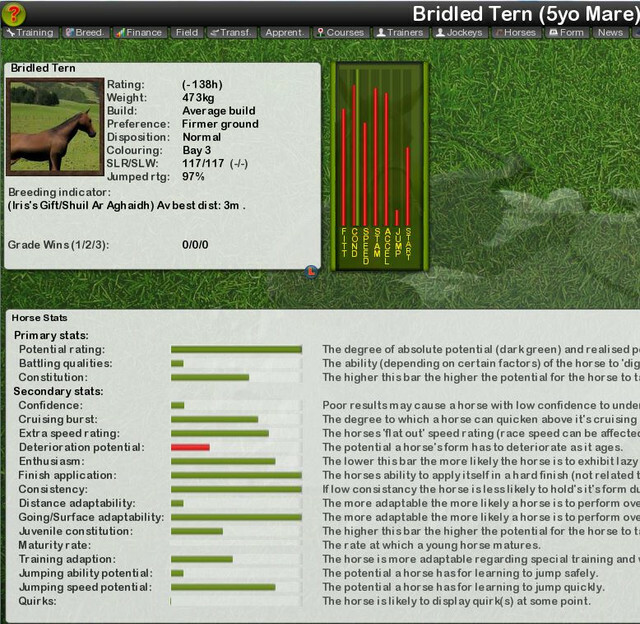 I added flat breeding to my 2m hurdlers a while back and my horses never recovered. Every time I have gotten full speed and that sort of cruise into jumpers, via flat, they have sucked. Actually that’s not entirely true they are great over about 1m to 1.4m. But finished at 2m. Course crack that particular puzzle and you maybe onto something. This is my best hurdler this season. I just found her and shes from 13-03-2016 . Her bars are awful and yet she can compete this season. The jumps is still a mystery!!!! I have managed to get decent cruising burst and extra speed in my jumpers this season. It took about 7 generations of breeding horses with the extra bars to get them to just beat my horses with lesser bars. Because of the inconsistancy of the CK, I am not sure if overall, this has helped all my horses as quite a few horses with similiar bars have been poor in the league this season. This is my best hurdler with a record of 2,1,1 this season. This is the 8yo horse I uploaded as a Grand National horse and has won twice so far this season. Both her Sire and Damme are in my league team this season as 3 milers.